Research shows that organizations with high employee satisfaction outperform peer organizations over time. For example, companies with high employee satisfaction outperform their peers by 2.3% to 3.8% per year in long-run stock returns – 89% to 184% cumulatively – even after you control for other factors that drive returns (Harvard Business Review, March 2016). Furthermore, the results suggest that it is employee satisfaction that causes good performance, rather than good performance allowing the organization to invest in employee satisfaction. Next, consider not only the total number of employees hired by your organization but also the collective investment in recruiting, onboarding, training, and development that the organization makes in these employees. A conservative estimate of the cost to replace entry-level employees is 40% of their fully loaded salaries. Meanwhile, the cost of replacing experienced and executive-level employees increases to 75% and 200% of their fully loaded salaries, respectively. HR leaders know that organizations will never realize the full return on that investment if they do not take steps to evaluate, design, and deliver best-in-class employee experiences that contribute to employee satisfaction. So what are some innovative tools and approaches for improving the employee experience, with the dual goals of yielding not only near-term gains but also strengthening the organization’s long-term performance? 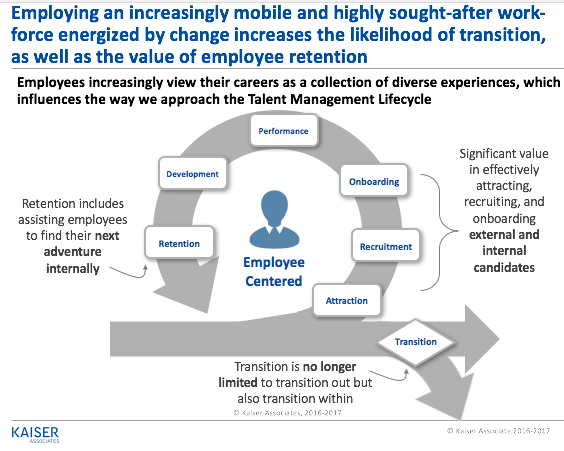 We have observed that when HR/Talent partners with non-HR business functions traditionally focused on the external customer experience (e.g., Marketing and Innovation / R&D) and applies those customer need-centric mindsets and approaches to the internal employee experience, powerful outcomes are manifested. Case Study Example: One of our clients, a global leader in consumer transaction technology, experienced first-hand the power and magic of an HR/Talent and Marketing/Customer Experience partnership to reimagine the employee experience (from initial recruitment through hiring, onboarding, training, and ongoing development). Following the lead of their Customer Experience colleagues, the HR/Talent leaders redesigned the new hire onboarding experience. Firstly, they listened to the needs and perspectives of their “customers” (the new employees). Then they developed employee “personas” (similar to the way customer “personas” are often developed by marketing teams) to differentiate and customize the onboarding experience, based on the needs of different new hire segments (e.g., executive hires vs. university hires, etc.). The result? Significantly higher new hire engagement scores and one-year retention rates. 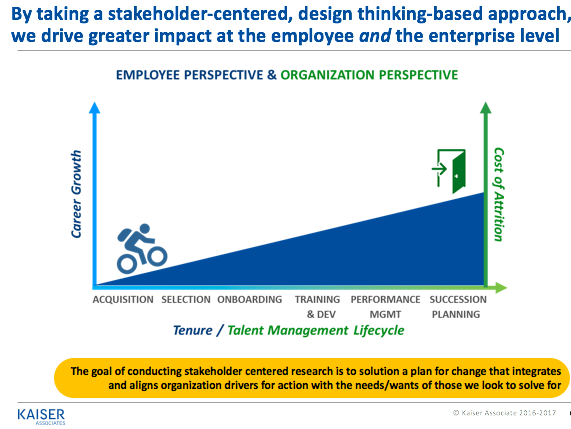 We have also found that by taking a stakeholder-centered, design thinking-based approach to HR/Talent processes and experiences, it is possible to drive greater impact at both the employee level and the enterprise level. Perhaps we shouldn’t be surprised by this outcome, when the goal of conducting stakeholder-centered research is to devise a plan for change that integrates and aligns organization drivers with the needs/wants of the stakeholders themselves. What is innovative is the application of these approaches to reimagining commonplace HR/Talent processes and experiences. Case Study Example: Another of our clients, a leading technology and professional services firm, sought to reimagine the employee experience with a particular focus on the experience of employees during years 1 and 2. Our client wanted to design an experience that energized and supported its employees in gaining the key opportunities and development needed to grow their careers at the firm, thereby improving retention at all levels of the firm, increasing employee engagement, and building greater transparency and trust between employees and the organization. To achieve these outcomes, we guided our clients through an employee journey mapping process that included focus groups and working sessions with target employee segments (e.g., critical talent, etc.). The result? 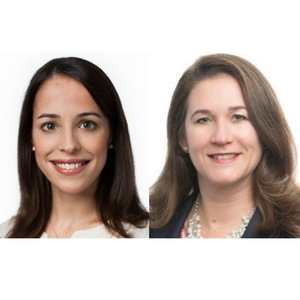 The development of a customized, employee-centric Employee Experience Journey Map framework that helps new employees by giving them a sense of what to expect throughout their first 1–2 years at the firm, and that benefits the firm by serving as a guide for future employee programming and investment decisions. Given the competition for talent and the cost of “not getting it right,” organizations who take an employee experience-centered approach to their talent programs will no doubt have an edge in the coming years. 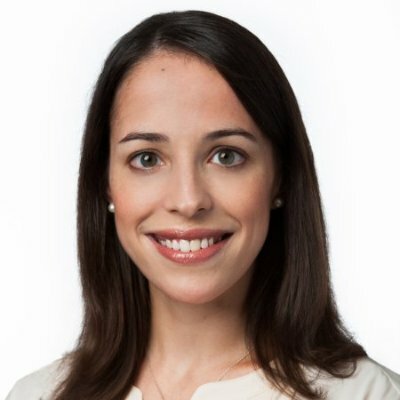 Lilith Christiansen is a Vice President at Kaiser Associates and co-leads the firm’s Organization Development Practice. She has led numerous Onboarding Organization Design, Process Improvement, Change Management, Strategic Planning, and Employee Program Redesign projects for leading global organizations in both the public and private sectors. Lilith is a co-author of Successful Onboarding: A Strategy to Unlock Hidden Value Within Your Organization, published by McGraw Hill in 2010, and has written articles on several talent management issues featured in Government Executive, Human Resource Executive Online, Talent Management Magazine, and Investor’s Business Daily. She has presented on various human capital topics to organizations such as The Conference Board, Human Capital Institute, and the Treasury Executive Institute. Lilith holds an MBA from The Wharton School, University of Pennsylvania. 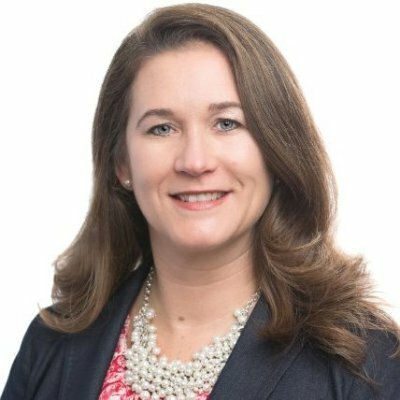 Sarah Hagerman is a Vice President at Kaiser Associates and co-leads the firm’s Organization Development (OD) consulting practice. Her specific areas of expertise include Organizational Design and Effectiveness, Culture Assessments, Workforce Analytics, Performance Improvement, Business Process Reengineering, Change Management, and Benchmarking across a wide variety of industries. She is a co-author of the Association for Talent Development (ATD)’s Talent Management Handbook (2015) and was a key contributor to the research of the book Successful Onboarding: A Strategy to Unlock Hidden Value Within Your Organization (McGraw Hill, 2010). Sarah holds a BA from Tufts University, an MBA from the Kellogg School of Management at Northwestern University, and a Certificate in Leadership Coaching from Georgetown University’s Institute for Transformational Leadership.